I have not updated the blog for a while, because I have been working abroad (Singapore). 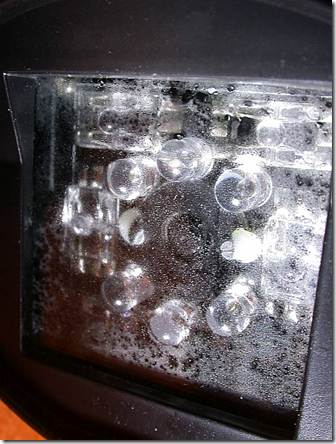 During that time, the weather camera developed dew problems after a long period of massive rain. The camera house is not 100% water proof, and the variation on outside air humidity causes dew to settle on the inside walls. Another problem was the big front glass that was exposed to the cold environment, it became the coldest “wall” as seen from inside, and therefore the most likely place for dew to settle, precisely where you don’t want it. The result is seen below, lots of dew causing fogging of the image! 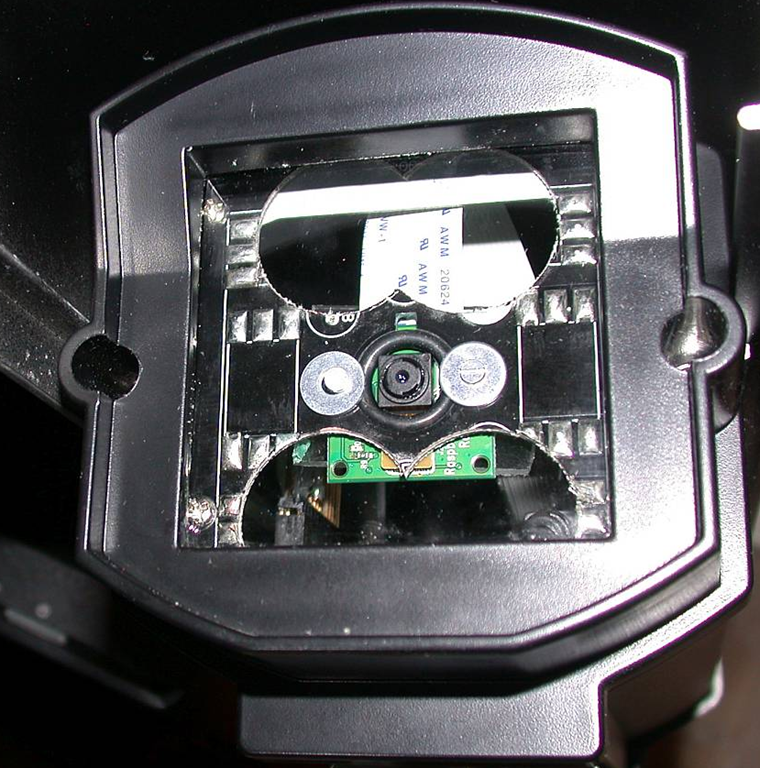 The camera chip & lens cannot be seen in that image, but it is in the centre between the fake LED components (the camera house is from a fake surveillance camera). The fake LEDs site on a dummy PCB that is also part of the problem: it make internal ventilation problematic, increasing the dew problems. As a first step in fixing the problem, the camera was opened and all the fake LEDs were removed. After all, their only “purpose” was to cause strange reflections of the Sun. Next, 4 big holes were drilled in the fake PCB, so that air could be freely ventilated between the space between the camera and front glass, and the rest of the camera house, where the Raspberry PI generates some heat. 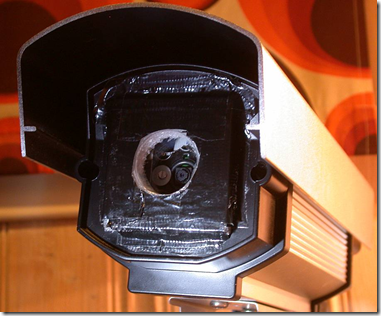 Measurements have shown that the temperature inside the camera house is generally about 6 degrees C higher than the outside air. This looks like an improvement, but the front glass is still much to large and exposed to the environment. 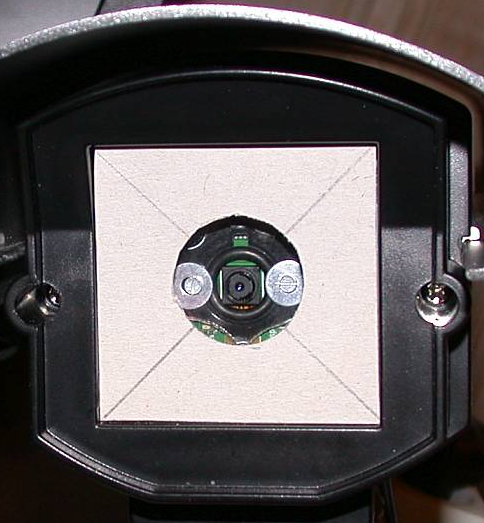 How about masking off the part of the glass that the camera isn’t looking through? I did some indoor tests with a piece of cardboard to determine the size of the area that needs to be clear of obstructions, and the result is shown below. Most of the glass can be covered without obstructing the view from the Raspberry Pi camera lens. The thinking is to cover and insulate the the glass plate on the outside so the limited heat generated inside the camera house has a smaller surface to “work on”, i.e. just the inside of the unobstructed circular glass area exposed to the environment, right in front of the lens. The final result was as show above: A piece of Plexiglas with the same size and shape as the cardboard plate (slightly bigger hole) with a 1cm thick foam plate as insulation towards the glass. The assembly is then attached to the front using water proof tape. The resulting camera performance can be observed on the weather station page .